The Mother's Bracelet is available in all sterling silver or a combination of sterling silver and 14K gold filled beads. 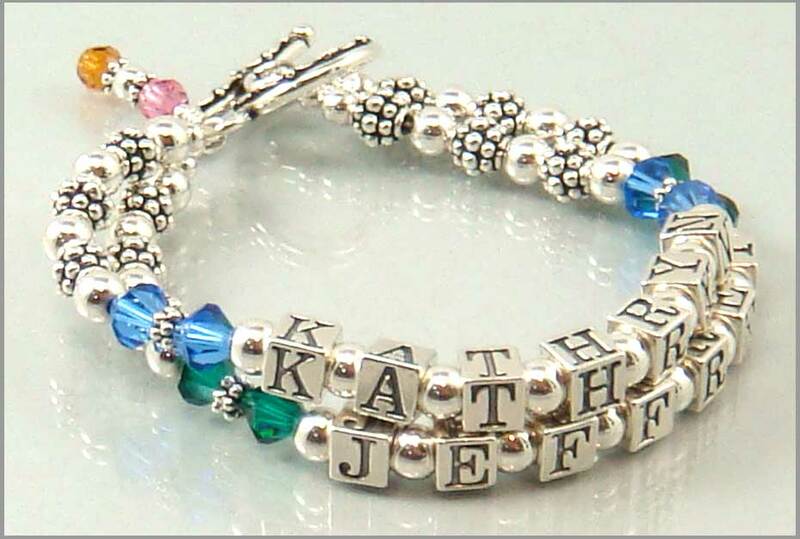 Each bracelet includes a child's name in the highest quality sterling silver letter blocks (up to 6 letters), their birthstone in Swarovski crystals (optional), and a hand wrapped dangle at the toggle clasp with the crystal birthstones of the Mother and/or Father. Click here for birthstones by month. A double strand Mother's Bracelet would include a child's name on each of two strands, a triple strand would include a child's name on each of three strands, etc. A double strand bracelet is shown in the photograph below. It may be possible to place two children's names on one strand for the additional letter charge of $6/letter for more than six letters per strand. Indicate multiple names on one strand in your order. Additionally, the Bali-style sterling silver beads and clasps shown in the photographs are a representation of the Bali-style sterling silver beads and clasps which you will receive in your piece. The beads and clasps will all be of the same high quality, style and size, but may vary in some of the finer detail. The overall intent of the design will not change. Additional $6 per letter for more than six letters per strand. Once your order is placed, you will receive an e-mail confimation with a final amount due, including sales tax and shipping charges, along with payment instructions. Payments may be made via credit card through Paypal. If you have ordered other items through the shopping cart, please indicate that and the items will be shipped together, thus reducing the shipping charges. The "Initials and Birthstones" Grandmother's Bracelet combines a sterling silver letter block initial of each grandchild, flanked by two Swarovksi crystal birthstones. Click here for birthstones by month. Nine sets of intials and birthstonees can be accomodated on an average size bracelet. If more initials are required, a two strand Grandmother's Bracelet is suggested, or the "Birthstones Only" Grandmother's Bracelet described below. Additional $6 per letter for more than six letters per bracelet. Once your order is placed, you will receive an e-mail confimation with a final amount due, including tax and shipping charges, along with payment instructions. Payments may be made via credit card through Paypal. If you have ordered other items through the shopping cart, please indicate that and the items will be shipped together, thus reducing the shipping charges.